James Gilbert Vandiver [1889-1973] and Martha Viola ( Mangum ) Vandiver[1890-1989 ].
" The Children of James Gilbert and Mattie Viola ( Mangum ) Vandiver "
1. Fred Audie Vandiver was born : September 26, 1908 and died : September 12,1995 . 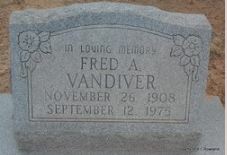 Fred is the oldest son of James Gilbert and Mattie Viola ( Mangum ) Vandiver . Fred first spouse is unknown but there was one son of that marriage , living. Fred's second spouse was Flossie Vandiver and they had a daughter named Pricilla, living. their daughter Pricilla meet and married Quentin Ham ( Buster ) . They were married ( Feburary 18, 1956 ) in Fort Sumner , New Mexico. Ouentin Ham ( Buster ) husband of Pricilla Jean ( Tillie ) Vandiver Ham and only daughter of Fred and Flossie Vandiver passed away January 3, 1997 . Quentin Ham born : September 11. 1933 in Farwell , Texas and graduated from Farwell High School in 1951 . Grave side services were January 3, 1997 at Lawn Haven Memorial Gardens , Clovis , New Mexico with Rev. Kevin Bushart officiating , Ouentin and Pricilla had one son Craig Ham of Clovis N. M. Quentin married Pricilla Jean Vandiver ( Tillie ) on Feburary 18, 1956 in Fort Sumner , N. M. Quentin was a self employed housing contractor . Survivors , wife Pricilla , a son Craig Ham of Clovis , New Mexico and two grandsons . Also five sisters , Ruby &Leona Meeks of Farwell , Texas , Barbara Meeks Watford of Clovis , N. M. , Sybil Meeks Alexander of Midfland , Texas and Shirley Meeks Standvick of Lubbock , Texas and two brothers Lawrence Meeks of Roswell . N.M. and Howard Meeks of Calero , Oklahoma . 2. Troy James Vandiver born:December 12 , 1910 and died : January 15, 1975 . Troy was the second oldest son of James Gilbert and Mattie Viola ( Mangum ) Vandiver .Troy made their final home in Blanchard , Okahoma . Troy worked for John Deer Tractor Company as a salesman for years . He meet and married Novella Vandiver in Clovis , New Mexico . He and wife Novella first made their home in Clovis , New Mexico , where they lived for several years . They moved to Oklahoma after his retirement . Troy James is buried in Blanchard , Oklahoma .There were no children from this marriage . 3. Bevie Gertrude ( Vandiver ) Burnett born 01 May 1913 is the oldest daughter of James Gilbert and Mattie Viola ( Mangum ) Vandiver . Bevie meet and married Bennie Burnett . Bevie Burnett and Bennie Burnett had four sons. They are , James Burnett , Darrell Burnett , Jerry Burnett and Dennis Burnett . Bevie is 90 yrs old and lives in assisted living in Wichita , Kansas . Bevie Gertrude [Vandiver] Burnett died in 2007. 4. 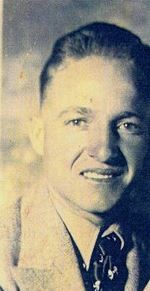 Ruel Herman Vandiver ( Jack ) born : September 26, 1915 in Danvillle , Yell County , Arkansas . Ruel Herman Vandiver died ; July 1, 2000 at Memorial Medical Center , resided in Elephant Butte , N. M. Ruel's first wife was Juanita Frye of Clovis , New Mexico . They had one daughter together , Billie Sherlene Vandiver who now lives in Roswell , New Mexico . Juanita ( Fyre ) Vandiver is deceased . Obituary printed in the Roswell Daily Record N.M. dated July 2, 2000..... Ruel " R.H. " Herman Vandiver ( 1915-2000) Ruel retired in 1981 . He had owned and operated the White Mattress Center in Roswell , New Mexico . Upon his retirement he moved to Elephant Butte , N.M. Ruel was a 32 Degree Mason and also a commerical pilot . He is survived by his wife Charolette W. Vandiver , one daughter Cherlene Guess , Roswell , N. M. , one brother Dale Vandiver and wife Joyce Vandiver of New Mexico . Ruel's surviving sisters are : Bevie ( Vandiver ) Burnett , Wichita , Kansas , Letha ( Vandiver ) Calhoune , Florence , Ore. ,Mona ( Vandiver ) Tuffee &Bernie Tuffee , Pauline ( Vandiver ) Mott , Pamona , Calif. At Mr. Vandiver's request , crematioin will take place and a Memorial Service will take place at a later date . Arrangements by Baca's Funeral Chapel . Ruel often called " Jack " also served our country in the military. 5. 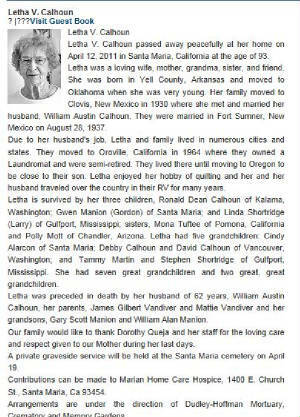 Letha Viola [Vandiver] Calhoun was born 21 Jan.1918 in Yell Co. Arkansas . 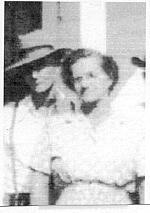 Letha meet and married William [Bill] Austin Calhoun on 28 August 1937 in Ft. Sumner , New Mexico . William [Bill] Austin Calhoun was born , 08 June 1917 and died 09 June 2000 in Florence , Orgeon . Letha Viola and William were married 63 yrs when he died . The couple had lived in Clovis , New Mexico until about 1951 , when they moved to Oregon . They have three children , Dean Calhoun , Gwenda[Gwen] [Calhoun] Manion and Linda [Calhoun] Shortridge , five grandchildren and seven great grandchildren . 6.Mona Ozelma Vandiver [1922-2012], was born Aug 3, 1922 in Oklahoma. She died August 20 2012 . She was first married to Paul Lester Clinton [1918-1976] .Then married a second time , 22 Sept 1991 to Bernard C. Tuflee [1923-2003. 9. Lindberg Nathaniel Vandiver ( Lindy ) born:May 7, 1927 and died : November 13 , 1944 . Lindy was only 17 yrs old at the time of his death and died in a car accident. He was buried at Clovis, New Mexico by his parents , James Gilbert and Mattie Viola ( Mangum) Vandiver in Clovis Memorial Gardens , Clovis , N.M.
8. Mary Ella Ruth Vandiver born: abt 1928 and died : 1949 at 21yrs old . She is buried by her parents James Gilbert and Mattie Viola ( Mangum) Vandiver in Clovis Memorial Gardens , Clovis , New Mexico . Mary Ella was not married . 10. Kenneth Dale Vandiver [1931-2006] . Kenneth was born, Jan 25, 1931 in Clovis , Curry Co, New Mexico and died De. 17, 2006 in Albuquerque, Bemalillo, New Mexico. Note ; Updating this page as many changes to add . information is not complete. Please check it later . Thank You , Rebecca . Family Tree notes received from daughter of Ida Pearl ( Vandiver ) Griffin , Wanda Jean ( Griffin ) Smith . Research information and journal notes about Hollimon and Portwood Family Tree from Rebecca Hollimon . Notes , research information and obituary information is all apart of the " Journal of the Family Tree of Hollimon , Vandiver and Portwood. " Using only information of the family members who are deceased . Please send all your comments , remarks or other information to Rebecca at seawinds31@earthlink.net . Would love to hear from anyone who has ties to these family trees . Would love to have some pictures from anyone in this family tree . Peace and Love .
" Remembering the Family Tree of Vandiver , Hollimon and Portwood With Honor , Love and Respect ". Copyright Pen4ing on " Family History Journal of Hollimon , Vandiver and Portwood [2017-2018] .